Are you looking for the perfect, straight teeth you have always dreamed of? You can have beautiful, straight teeth and a fantastic smile with Invisalign clear braces. Infinity Dental Clinic are leading providers of Invisalign in Leeds. The number one reason why Invisalign® is the world leader in orthodontics is due to their impressive clear aligners, which are incredibly discreet. They are made from a patented clear acrylic which means most people will not even notice that you are wearing them. Our Invisalign team is led by Dr Hannah Wilson. We are very proud to have helped so many patients achieve stunning, long lasting smiles. Infinity Dental Clinic is one of only a few Dental Practices in the UK to provide the latest Digital Dental techniques enabling us to perform Dentistry with optimum precision. Our in house Intra-Oral Digital Scanner and CBCT Scanner allows us to provide the highest standards of Dentistry at our clinic. You can see examples of some of our work by reading our weekly informative blogs from Infinity Dental Clinic, leading Invisalign providers in Leeds. There is no question why Invisalign® is the most popular orthodontic system in the world. It is a series of clear, removable aligners that are custom-made specifically for your teeth. The reason why Invisalign® is so popular is because the aligners are incredibly comfortable and discreet. They are made from a patented clear acrylic, which means most people won’t even notice that you are wearing them. Another advantage with Invisalign® aligners is that they are completely removable, so you can easily remove them to eat and brush your teeth. This flexibility means there is no disruption to important occasions in your life and the way you eat and enjoy your food. As demonstrated below, Invisalign® treatment includes a digitally designed 3D computer simulation programme to allow us to precisely design your smile. This can also be included in a wider treatment plan, for example allowing provision of Cosmetic Dentistry and Dental Implant placement. We are proud to be a leading provider of Invisalign here in Leeds, taking great pride in creating beautiful smiles. If you would like to read more about Invisalign from their website click here. Who is Suitable for Invisalign®? Here at Infinity Dental Clinic in Leeds we have vast experience in treating a wide range of patients using Invisalign®. As long as you have healthy teeth and gums, we can assess your suitability and tailor make a bespoke plan your you. Do you feel self-conscious to smile in public or in photos? CONSULTATION: At your initial assessment you will have a full dental examination, Intra-oral digital scan, x-rays and photographs taken. This digital scan and additional clinical information will be uploaded to the Invisalign CLINCHECK® software. Invisalign CLINCHECK® is a specially designed computer simulation programme which allows you and your practitioner to precisely design your future smile using 3D animation. This will give us the control to design your perfect smile. INITIAL FITTING OF THE ALIGNER: You will be fitted with your first aligner and shown how easy it is to wear and remove them. You will then be given 4-5 aligners to take with you and given clear instructions on how often to change these. You can expect to replace your aligners every 10-14 days and your teeth will start to move gradually throughout this process. The number of aligners required will depend on the length of the treatment and the severity of the required tooth movements. The aligners have been precisely designed to apply minimal pressure to your teeth, when the movement is completed, you simply move to the next aligner, and continue until you have beautiful straight teeth. REPLACEMENT ALIGNERS: You will attend the clinic on average every 2 months for an assessment and be provided with the next 4-6 aligners.Treatment with Invisalign® usually takes between 4-18 months depending on the amount of tooth movements required to achieve your planned aesthetic smile. 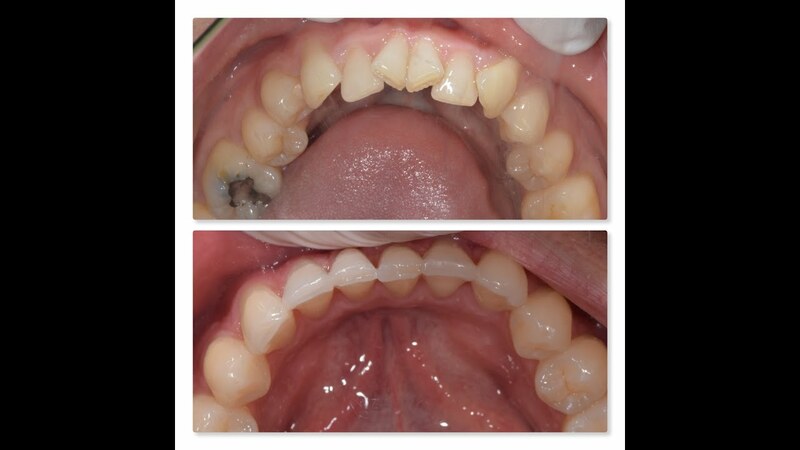 COMPLETION OF TREATMENT: You will now have your stunning NEW STRAIGHT SMILE. At Infinity Dental Clinic we can also provide teeth whitening, which many patients choose to enhance the appearance of their new straight smile. It took time, skill and investment to create your beautiful straight smile. Removable Vivera® retainers are worn at night to prevent any future movement of your teeth. Vivera® retainers are made from the same patented technology as Invisalign® aligners, this means that your smile is protected with the most reliable and comfortable material available. You can expect some initial mild aching and tenderness as the teeth begin moving. This usually lasts for the first few days after the aligner is fitted. Painkillers can be taken if required. For the remainder of the treatment there is very negligible pain or discomfort and patients find them extremely comfortable to wear. Invisalign® aligner are discreet and comfortable to wear as there are no wires or brackets. They are virtually invisible so no one should notice that you are straightening your teeth. Invisalign® aligners are removable which means you won’t have any issues with eating and cleaning your teeth. We also offer flexible, affordable payment plans, meaning your beautiful straight smile can be achieved with stress-free monthly payments. Please see our fees and finance page for more information. Invisalign® aligners are comfortable to wear as there are no wires or brackets. They are virtually invisible so most people will not even notice you are wearing them, but they are sure to notice your NEW STRAIGHT SMILE. “I’ve just completed 20 months of Invisalign treatment, I know that seems like a long time but my teeth were really awful and now they’re absolutely perfect. After years of smoking, drinking all the wrong things and a fear of dentists but also being too embarrassed to see one. Took the plunge and visited 3 dentists for advice and quotes. One dentist made me feel awful to the point I had a panic attack. Infinity – Jasmine was so lovely at point of contact and Dr Patel just seemed so nice I felt really comfortable so signed up. I’ve never once felt nervous there and the treatment took longer than originally expected but Dr Patel wasn’t quite satisfied so decided on a few amendments to get the best results. Invisalign really works but you have to follow the treatment plan and it can be difficult as it’s quite a lifestyle change and in the first couple of weeks can feel sore but worth it. My teeth are now straight and now that Dr Wilson has finished my teeth off with composite fillings to make them even they now look natural, straight and white. Infinity is a welcoming and friendly practice. Dr Patel and Dr Wilson are brilliant at what they do and are not satisfied with anything less than perfect. On the plus side there’s plenty free on street parking.